This plug-in calculates the most often used color in a specified border of the active layer or selection. It can gather similar colors together so that they become predominant. The calculated color becomes the foreground color in the Toolbox. This filter is interesting when you have to find a Web page color background that differs as little as possible from your image border. The action of this filter is not registered in Undo History and can't be deleted with Ctrl+Z : it doesn't modify the image. 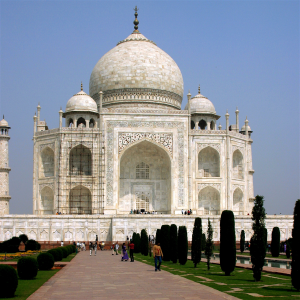 This filter is found in the image window menu under Colors+Info → Border Average. You can set there the border Thickness in pixels. 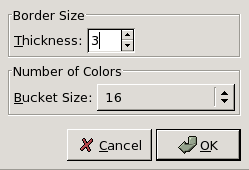 The Bucket Size lets you control the number of colors considered as similar and counted with the same “bucket”. A low bucket size value (i.e. a high bucket number) gives you better precision in the calculation of the average color. Note that better precision does not necessarily mean better results (see example below). Original image: colors are pure Red (255;0;0), pure Blue (0;0;255), and different but similar kinds of Green ( 0;255;0 , 63;240;63 , 48;224;47 , 0;192;38 ). The resulting color is a Red (254,2,2). The bucket size is low. So the bucket number is high. All color shades can be stored in different buckets. Here, the bucket containing red is the most filled. The resulting color is a nearly pure Red (254,2,2) and becomes the foreground color of the Toolbox. The resulting color is Green (32,224,32). Here the bucket size is high, the number of buckets low. Similar colors (here green) are stored in a same bucket. This “green” bucket is now the most filled. All colors in this bucket have the same values for the two most significant bits: (00******;11******;00******). The remaining 6 bits may have any values from 0 to 63 for the respective channel. So in this bucket, color red channels range from 0 to 63, green channels from 192 to 255, blue channels from 0 to 63. The resulting color is Green (32,224,32), which, for every channel, is the average between the limits of the channel range (63 + 0)/2, (255+192)/2 , (63+0)/2.